Born on March 25, 1914 on a farm in a small Norwegian-American community in the USA, Norman E. Borlaug earned an M.Sc. in forest pathology in 1939 and a Ph.D. in plant pathology and genetics in 1942, both from the University of Minnesota. In 1944, Borlaug joined a special Mexico-Rockefeller Foundation program to raise Mexico’s farm productivity, as head of the wheat research program. High-yielding wheat varieties and improved farming practices, first developed by Borlaug and his team in Mexico during the 1950s and adopted widely in what was called the Green Revolution, may well be responsible for saving more than a billion of people from starvation. 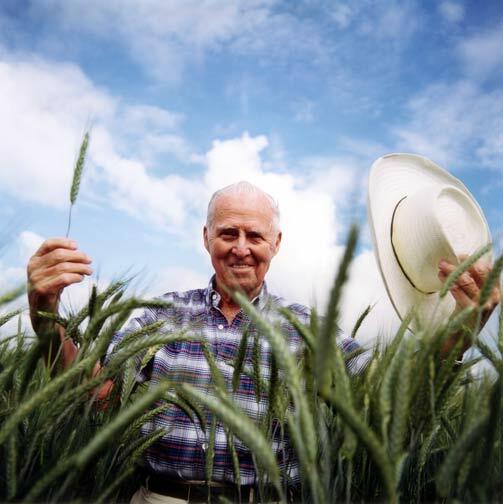 Borlaug travelled to India in 1963 at the invitation of a 38-year old Indian wheat cytogeneticist, M S Swaminathan. Working at the Indian Agricultural Research Institute in New Delhi, Swaminathan had seen field trials of the Mexican wheats and immediately grasped their potential for Indian agriculture. Through the efforts of Swaminathan, Borlaug and other visionary scientists and policymakers, seed of the new wheats reached Indian farmers in 1966 and was sown with proper fertilization and management. In 1963, India was harvesting around 10 million tons, and importing approximately 5 – 8 million tons during the early to mid-sixties. By 1968, wheat output rose to 16.5 million tons, and by 1970 it had doubled from its 1963 level to 20 million tons. India soon became self-sufficient in wheat production. The adoption of improved crop varieties and farming practices spread region-wide, with dramatic benefits for food security and livelihoods continuing into the 21st century. Over the two decades beginning in 1981, crop yields rose steadily while the proportion of South Asia’s population living on less than US$ 2 per day fell from 52 percent to 31 percent, despite significant population growth1. Today, high-yielding, disease-resistant wheat varieties based on Borlaug’s pioneering work are grown on more than 60 million hectares in developing countries – over 70 percent of the area planted with modern wheat varieties in those nations. These improved wheat varieties are responsible for bigger harvests that bring annual added benefits to farmers of at least US$ 500 million2. Borlaug received the 1970 Nobel Peace Prize for his Green Revolution achievements. His full-time employment at CIMMYT ended in 1979, although he remained a resident and part-time consultant at CIMMYT until his death in 2009. In 1984, he began a new career as a university professor, teaching one semester per year at Texas A&M University, which continued for 23 years. In 1986, he joined forces with former U S President Jimmy Carter and the Nippon Foundation of Japan, under the chairmanship of Ryoichi Sasakawa, to develop an African agricultural initiative. Over a 20-year period, the Sasakawa-Global 2000 agricultural program (now known as the Sasakawa Africa Association) has been working in 15 African countries to transfer improved agricultural technology to several million small scale farmers. Borlaug was especially proud of his role in establishing the World Food Prize in 1986. This prize has grown in stature and is now considered the “Nobel Prize” for food and agriculture. Nearly 40 men and women have been recognized for their outstanding contributions to increasing the quantity, quality and availability of world food supplies. Based in Des Moines, Iowa, USA, the World Food Prize Foundation has also developed outstanding educational programs to engage young people in world food issues. Borlaug always considered himself to be a teacher as well as a scientist. Today, several thousand men and women agricultural scientists from more than 50 countries are proud to say they were Norman Borlaug’s “students”. Borlaug used his fame and influence to champion the cause of smallholder agricultural development around the globe. Over a 63-year career, he travelled tirelessly to more than 100 nations, visiting farmers and agricultural scientists in their fields. It is estimated that over his lifetime he personally spoke to more than 500,000 students and ordinary citizens, explaining the challenges and complexities of world food production. Borlaug was voted a member of the academies of agricultural science of 11 nations, received 60 honorary doctorate degrees from those countries, and was honored by farmer and civic associations in 28 countries. The USA awarded Borlaug the Presidential Medal of Freedom, the National Medal of Science and the Congressional Gold Medal, the nation’s highest civilian award. Norm, as he liked be called, lived his life as a dedicated hunger-fighter, but one who was forever vigilant. In his 1970 Nobel Prize acceptance speech, he said: “…It is true that the tide of the battle against hunger has changed for the better… but ebb tide could soon set in, if we become complacent”. Borlaug passed away on September 12, 2009 but he continues to live in the hearts and minds of the people he loved to serve. Ravallion and Chen 2006. World Bank, 2007. World Development Report 2008: Agriculture for Development. This is in 2005 US $; see https://apps.cimmyt.org/english/docs/impacts/impwheat_02.pdf.in In addition to the benefits cited for increased yield per se, a 2006 study estimated the annual benefits to farmers from improved yield stability through use of CIMMYT-derived wheat varieties at more than US$ 140 million.